It’s mid-March. Next month, I will plant my vegetable garden. That means that right now I’m starting some seedlings inside the house, thinking about what I want to plant, and preparing my soil. Here’s how I prepare soil for a brand-new vegetable plot. Keep in mind that I am not a gardening expert. In fact, every year there some new gardening problem that completely flummoxes me. However, I do yield a big harvest every year, so I must be doing something right. 1. Pick a spot for the garden. One word: sunlight. The vast majority of food-producing plants like sunlight almost all day long, so it’s essential that your garden spot gets full sun. It should also be within reach of a water hose, since water is another essential part of a garden. 2. Observe the spot. Notice how the sun travels over the spot so that you can plan out where to put big plants. Take a shovel and dig a hole. Look at the soil. Is it compact and clay-like? Is it loose and rocky? Are there worms in it? How dark is the soil? 3. Determine the type of soil you have. Ideal soil is loamy, a combination of sand, silt, and clay. It holds together enough to make sure water gets to the roots, but it also drains water away so you don’t get water log. 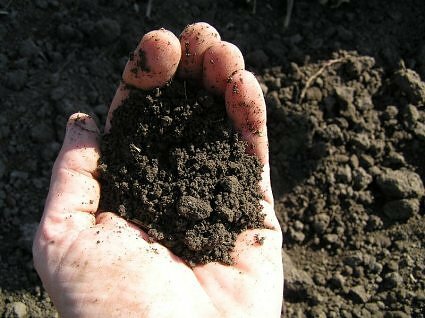 When you squeeze loamy dirt in your hand, it forms a soft crumbly ball. It should be dark, which indicates nutrients for the plants. 4. Get a soil testing kit. They sell these kits in all gardening stores. I started doing this recently and got great results. Soil testing kits let you know two things: the acidity of the soil and the nutrients in the soil. Knowing this information helps you prepare the ideal environment for your plants. 5. Test the acidity. This is not as complicated as it sounds. Most plants want a PH range between 6.3-6.8. If your soil is in that range, you’re golden. If it is not, you may have to add something to the soil to raise or lower the PH. Your local nursery can help you out with that. 6. Test for nutrients. Soil is broken down into three major nutrients: nitrogen (N), phosphorus (P), and potassium (K). They are always in that order, N-P-K. Last year, my soil had abundant amounts of phosphorus and potassium but low levels of nitrogen, so I added an organic fertilizer with a high amount of nitrogen into the soil. I also added a general fertilizer–cow manure to be exact. It is the cheapest fertilizer and works great, as far as I can tell. Most organic farmers I have talked to swear by chicken manure. Either way, stick to organic when you’re dealing with fertilizer since chemical fertilizers don’t work as well and are usually more expensive. Your nursery can help you with this. 7. Dig the soil. Ready for a work out? Because you’re going to get one. To dig, take your shovel and get it as deep in the ground as you can. I try to get about a foot down. Bring up the shovel of dirt and turn it over so that what was on the bottom was on the top. Repeat until you have done the entire garden plot. Doing this loosens and aerates the soil and is essential for healthy plants. I usually dig the soil twice: once around now to loosen the soil and remove weeds and a second time about a week before I plant to add in fertilizer. That means I will dig once during this month and once next month. You can also use a rototiller to do the job for you, if you can get your hands on one. Some people would think March is way too early to be doing some of this, and it is–if you live some place where the ground is still frozen. But I live in California and see no reason I can’t start gardening as soon as it’s not pouring rain. Besides, digging in March gives the weeds time to decompose in the soil and gives the soil to rest before its big job next month: making me some food. Thank you for the info… I am a newbie, period. I have gotten started with flowers, but my neighbors have been planting veggies since I can remember. He always tries to talk me into doing it as well, and this year, he and his room-mate planted some Parsley, and other goodies in a border to give to me. It was a very nice surprise, and although they don’t know it yet, I am doing my homework, as I have decided to go all in! =D These same two bought me the very best strawberries I have ever eaten in my entire life (no exaggeration), and then took me, just yesterday, to the farm they got the berries from. I bought two quarts, and now am planning on getting all the details together to start my very own strawberry patch. Greg and Alan will be sooooo proud of me. Thanks again!! Marlene, you’re welcome. I’m happy to hear you’re getting into gardening. It sounds like you have some great neighbors.